Image: Doug Murray/Icon Sportswire/Getty Images. 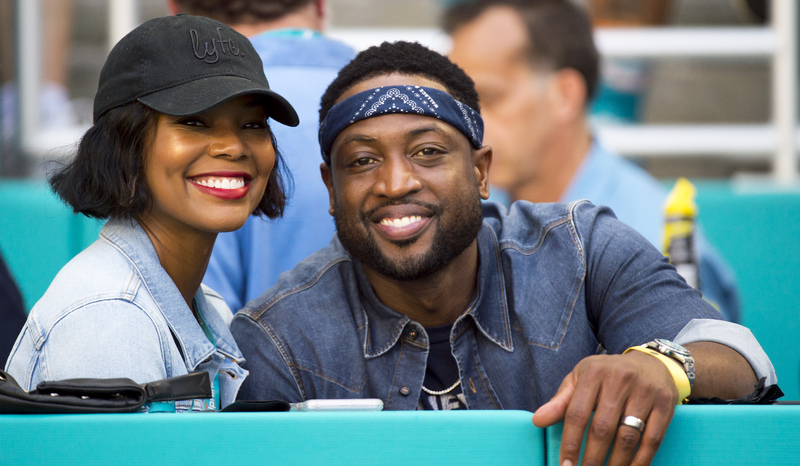 Dwyane Wade and Gabrielle Union seem to be soaking in every moment they can of their newly minted status as parents. One week after welcoming their daughter into the world, the couple revealed her name through a super-sweet Instagram post on Wade’s account, which also reveals his new tattoo. Can you guess how the two are connected? That’s right. Wade is so smitten he’s already inked his daughter’s name into his skin. According to E! News, Union and Wade have shared a lot of significant moments from the last week on their respective social media accounts, including the same slideshow of photos from the hospital with nearly identical captions. Union has revealed that Kaavia is already a daddy’s girl, and Wade shared a sweet photo of himself relaxing with Kaavia in his lap while he apparently watched some football to relax. It’s heartwarming to see this family bonding and enjoying quality time together. According to E!, Union and Wade started dating in 2009, then got married in 2014. Union has been especially forthcoming about how hard the road to parenthood has been for both of them. In her 2017 memoir, We’re Going to Need More Wine, Union revealed she suffered multiple miscarriages and struggled with IVF to conceive before getting pregnant with Kaavia. These moments are well-deserved, and we’re excited the pair are sharing them with their fans.